We still have a little value on The Cat’s Whole Foods gift card. Headed there today to pick-up something for the weekend. 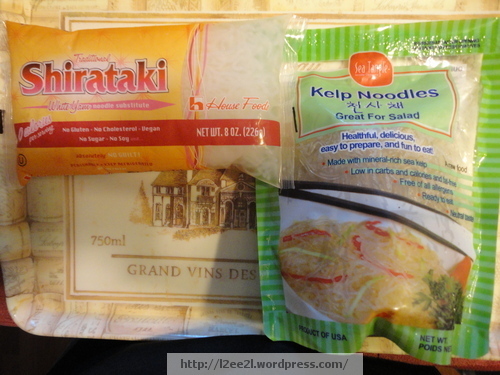 On the left “noodles” made from yam paste, on the right kelp. The grocery person there said she’s tried both and both are good. We’ll see. I’m not revealing everything today. Wait for the weekend. Not bad considering I find Whole Foods kind of pricey. 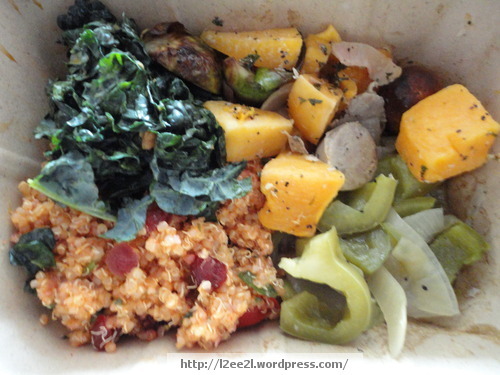 Quinoa, kale, butternut squash, Brussels sprouts, and green bell peppers with sausage. I guess I wasn’t paying attention when the server was pitching the lunch, when she handed me my package she said no added fat (except for the thin slices of sausage), and very little salt. Thought about picking up more barbecued smoked pork belly. Decided on their self-serve deli section to see if there was something and picked-up a small portion of pork chile verde. 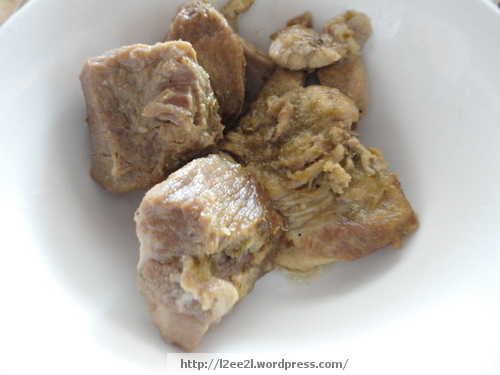 Pork slowly simmered in green chili and spices. Yum! Today was my last regularly scheduled day at W-S. I have one more on-call day, and one inventory day, but today was the last regular work day (I was only hired for the Christmas season). To celebrate I got a cookie from Starbucks (I have a gift card). 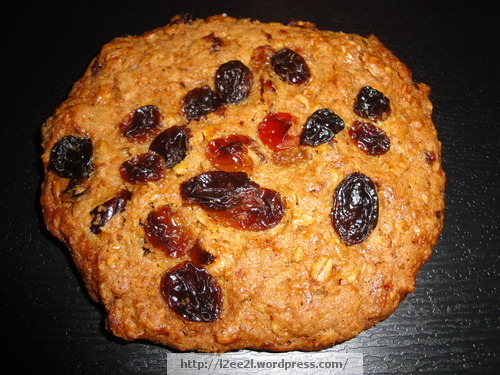 Oatmeal, cranberry, and raisin. You know I’m a sucker for oatmeal cookies. It’s pretty good. Shh, in some ways, it’s better than Chef P’s, just don’t let him know. 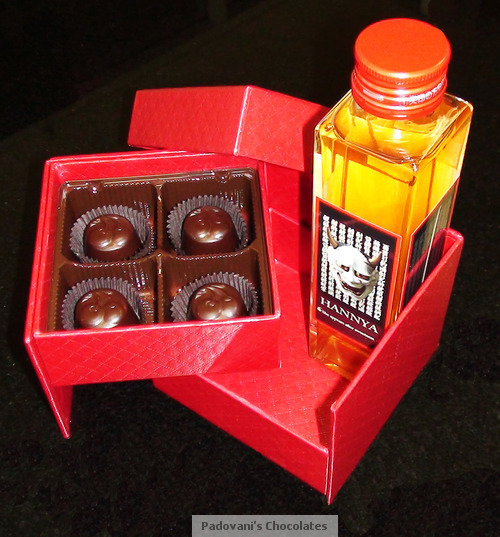 Chefs P & p have been toying with a new sake ganache flavor. Ginkoubai Hannya Tou sake is a chili pepper infused sake. It’s supposed to start off sweet and end with the chili pepper. Chefs newest obsession. We got to try (one for The Cat and one for The Mouse). It’s good. Uhm, for those of you with queasy stomachs, beware (it’s not that bad, really). Based on the previous post, we pushed the envelope again yesterday. The Cat wanted to go to the outlet mall. In our opinion, there’s not too much choice in the eating department out there. There’s a restaurant I’ve been curious about in the nearby town. Thought we’d give it a shot. 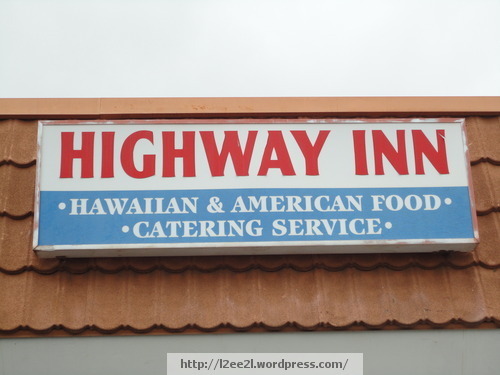 The sign pretty much says it all (94-226 Leoku Street, Waipahu, Hawaii). 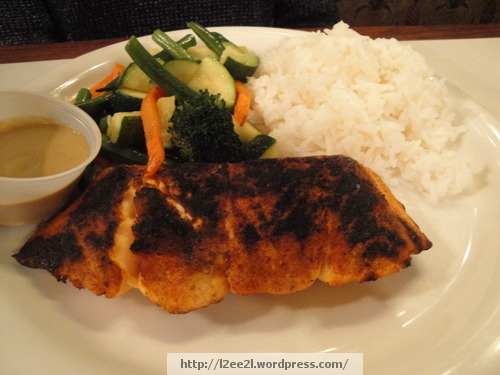 I saw on the online menu butterfish collars for The Cat (at least she had one default choice. 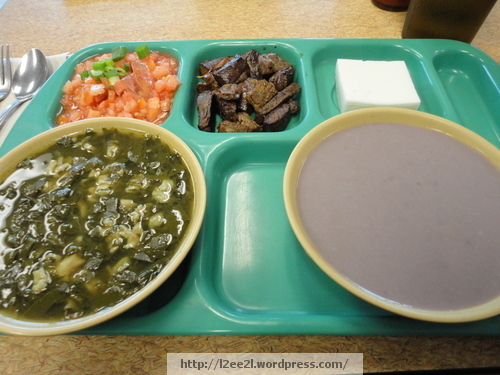 Na’au Pua’a |nah-ow poo-ah-ah| is a Fear Factor dish. 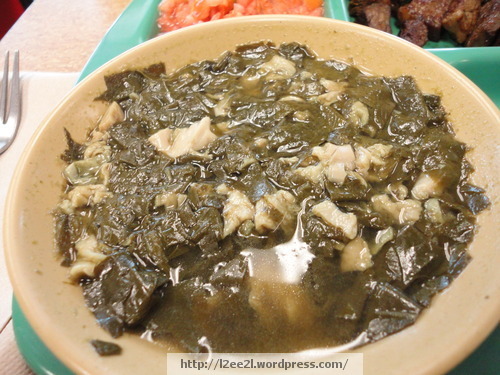 It’s chitterlings (pig intestines) and luau leaves in a soupy base. The literal translation is gut (na’au) of the pig (pua’a). It’s on the saltier side, and easier to eat than to pronounce. 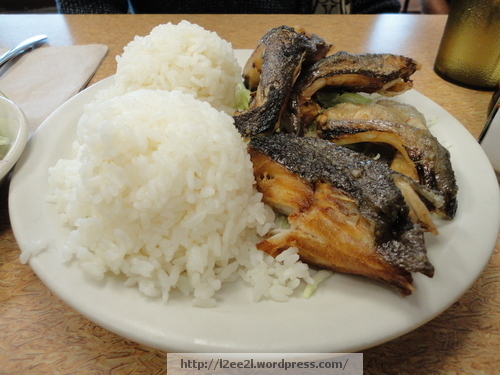 From their menu: Choice of Beef Stew, Tripe Stew or Na’au Pua’a Rice or Poi (brown rice or poi add 30¢), Lomi Salmon or Mac Salad, Pipikaula, Haupia. Went with poi, and lomi salmon. This stuff is good. But be warned, you have to like pig offal and luau leaves. I do. As good as the stew was, the pipikaula was really good. Pipikaula |pee-pee-cow-lah| Our most popular dish, pipikaula was a favorite snack among paniolos (Hawaiian cowboys) during long cattle drives in the 19th century. A salted, dried beef strip, some liken pipi (beef) kaula (strip) to beef jerky, but our version is a bit different. Our pipikaula is seasoned, dried and then grilled to enhance the flavor. After all that, The Cat’s deep-fried butterfish collar was almost anti-climatic. The collar is just behind the head of a fish. If The Cat can’t get the head, her next favorite is the collar. When our server asked how everything was I suggest he try the stew. His one word reply, No. That’s okay, more for me. According to their website, they’re set to open another location townside. Yay! 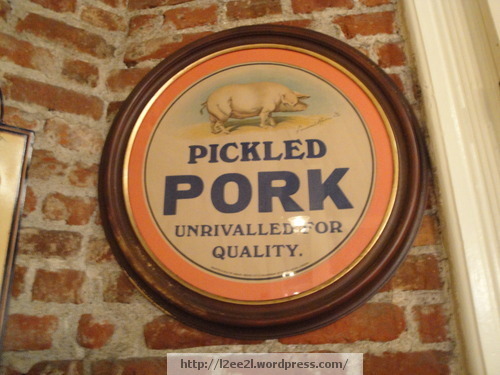 More pig offal, more often. Bring it! This post may seem a little discomboobled, bear with me. A couple of stars must have been in alignment last night. I occasionally watch a program that goes across the country looking for businesses that serve good home-style cooking. One thing that stands out in my mind is the dedication the chefs have in producing the best food they know how. 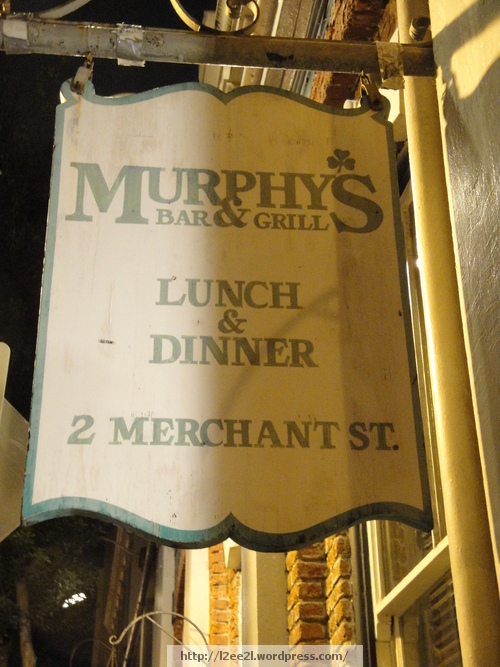 On one segment, the program highlighted Murphy’s Bar and Grill (2 Merchant Street, Honolulu, Hawaii), an Irish style pub. One dish piqued my curiosity, shepherd’s pie. We get in and she is impressed with the ambiance. Kind of vintage, homey, warm. It was a toss-up between a daily special of liver, onions, and bacon with Marsala sauce or shepherd’s pie. The server suggests the shepherd’s pie. Shepherd’s pie it is. 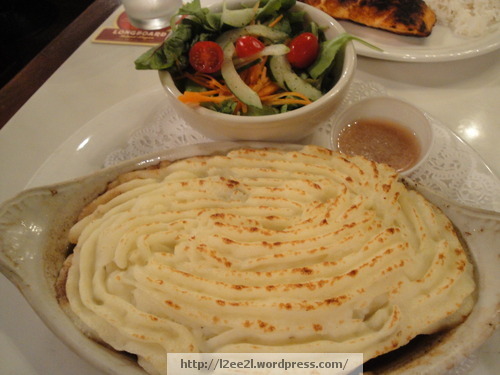 Traditional pie with lamb and vegetables, topped with mashed potatoes, served with a house salad. Fresh carrots, parsnips (first time trying it for me), celery, and onions. The Cat went with blackened salmon, medium rare. She thought it was just okay. She wasn’t used to the blackened seasoning. If she orders it again, she would have it prepared broiled. 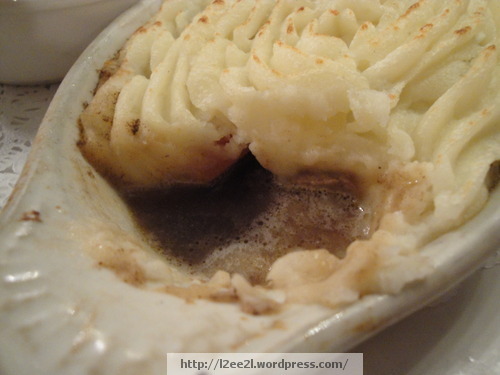 I liked my shepherd’s pie, I had to ask for a spoon to get all the gravy. 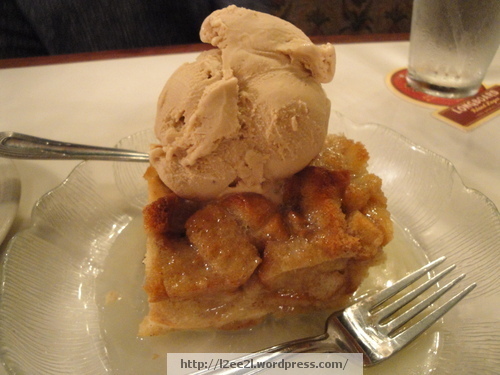 We shared a Bread Pudding with Irish Whiskey sauce and whipped cream. Except we asked to substitute the whipped cream for a scoop of Kona coffee gelato. The Cat’s favorite of the night. At the end, she wants to come back. She was impressed with the whole package, not so much on her dinner, but the atmosphere, dessert, price, and yes, food (overall). The Mouse was very happily surprised. The burgers are next on my agenda. Hee hee! There is another picture I took of the “atmosphere”. I was debating whether to post it or not. What the heck. Sorry, I couldn’t help myself. 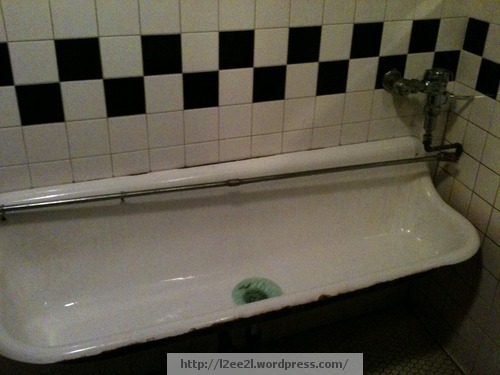 The pipes even rattled a bit when flushed (sorry again TMI), talk about vintage. Heh heh.